Khomputer (Khemosabi++++// x Zaza Kaborr) was purchased sight unseen as a two-year old in 1993, and used privately for fourteen years on his former owners' ranch. In 2007, his new owners Ken and Connie Walling made this handsome Khemosabi son available at public stud, giving mare owners a rare opportunity. 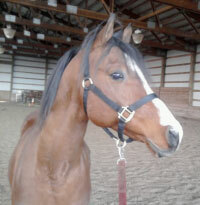 SCID clear and CA N/N, he is both Sweepstakes Nominated and a SHN Payback stallion. Khomputer knows how to use his hocks. Connie believes Khomputer has a lot to offer, showing many traits of the "Khemo horses." These include a "lovely head, fine neck and topline, good bone and fabulous hocks. 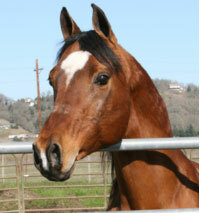 He is a true gentleman with the most gentle, loving disposition you could ask for in a stallion. Although Khomputer was never shown, his dam was shown in hunter pleasure and produced a number of performers including Khomputer's full brother, Khopy Khat, also shown hunter pleasure." 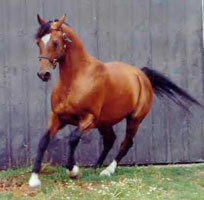 Khomputer's first foal, son Baskkhemo at 16 years. Many of his early foals went to private homes and were not shown. However, his lovely daughter, Khalla Lillie, went Region 4 Reserve Champion Sport Horse Mares In-Hand AT 2 and Over, for owner Karen Kirsch. Connie shares additional highlights of Khomputer's offspring. "Others shown were Khweyn (Dressage, Hunter Hack, Hunter Pleasure, and SHIH), Khadanska (Mare Breeding), DB Khobra (Stallion Breeding), and Baskkhemo (Stallion Breeding)." What does the future hold for Khomputer's foals born at the Wallings's? "The oldest foals have just turned three," Connie relates, "and are being readied for their careers under saddle. A yearling Anglo filly also awaits her show career. Two half-Arabians are expected this spring out of NCHA money earning mares, one by Docs Hickory and another by High Brow Hickory." As you've come to expect from Khemosabi sons, versatility is a hallmark of Khomputer's offspring. 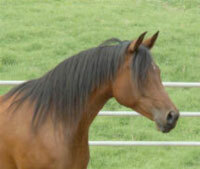 You are invited to stop by and visit Khomputer and his foals and consider him for your special mares.